This is another recipe from Martha Stewart’s Cookies. I absolutely loved the apple filing in this recipe. It uses dried apples, which are simmered in apple cider and intensifies the apple flavor, as well as make preparing it much quicker.The recipe calls for dried cherries, but I substituted craisins because I always have them on hand and they are much cheaper. They really added a nice contrast to the apples. I also cutted up the apples with kitchen shears before simmering in the cider.I cooked the bars for the time recommended, but they were overcooked and slightly burnt around the edges. Next time I would cook them as much as 10 minutes less. I would also only put 3 cups of the oat mixture on the bottom so there is more for the top. These definitely need to be completely cool before you cut them. They might even be better if left to sit over night and soften up a bit. I wouldn’t know though because they were gone the first night. Enjoy! Preheat oven to 375 degrees. Butter a 9-by-13-inch baking dish. Simmer apples, cherries, and cider in a covered saucepan, stirring occasionally, until fruits are softened and plump, about 5 minutes. Drain, reserving 2 tablespoons liquid. Let cool. Coarsely chop fruit. Combine with 2 tablespoons sugar, 1/4 teaspoon cinnamon, and reserved cooking liquid. Whisk together oats, flour, baking soda, salt, remaining 3/4 cup sugar, and remaining 3/4 teaspoon cinnamon in a large bowl. Cut in butter with a pastry blender or 2 knives until crumbs range in size from peas to gum balls. Press 4 cups of oat mixture into bottom of prepared dish. Spread fruit filling on top, leaving a 1/4-inch border on all sides. Sprinkle remaining oat mixture on top. They look soo delicious I’m drooling! I keep picking up that book, wanting to buy it. They looks delicious! Nice texture. i love anything w/fruit in it! these look so good! Apples, cherries, oats, I’m in. I love a good bar cookie and these sound great! I like the idea of using craisins in place of dried cherries… which are sometimes hard to find. I hate when I overbake things. I tend to be hyperattentive when I’m baking for fear of doing that!! They are beautiful Barbara! I’d like to make a batch this weekend! Beautiful, really! yummy, those look good. anything apple reminds me of fall – which is too far away. I am Barbara’s mother and know what a good cook she is. She brought me some of these delicious treats and they didn’t last long at my house either. Hope she brings more goodies soon! I haven’t had a chance to make something else from my book – but now that school is in session, I have lots of students to make something for! 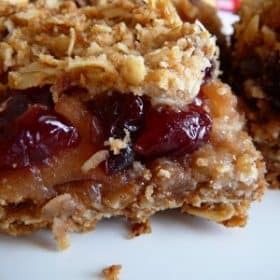 These bars look great – and I probably would do the same substitution with cranberries myself for the exact same reason!